Shower door rollers & wheels – Replacements for many different makes and models of steam showers, shower cabins, whirlpool showers, shower enclosures and shower cubicles, including curved glass models such as corner quadrant showers. Fitted with anti-rust 304 grade stainless steel bearings. Height adjustable Top Roller, spring loaded bottom roller. Chrome Plated. 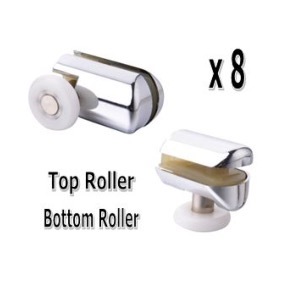 Shower Door Rollers & Wheels: Model 069.